In my post of January 29, 2009 I had mentioned that besides St. Peter's Basilica in Vatican city, three churches, two in Africa and one in South Korea, are claimed to be largest. I had also covered Basilica of Our Lady of Peace, Yamoussoukro, Côte d'Ivoire. Today I am covering the second church which also claims this honour. 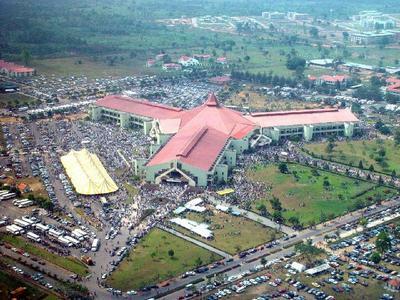 Winners' Chapel (aka or Faith-Tabernacle), Ota, Ogun State, is reportedly the World's largest church building in the World. It has a congregation capacity of 50,000 people inside and another about 250,000 outside. The auditorium took 12 months to be constructed and is particularly remarkable for its architectural masterpiece as there are no pillars within it to hold the gallery. Bishop David Oyedepo of Nigeria founded the Living Faith Church on May 2, 1981, and this church is part of 20 square kilometre (5,000 acre) sprawling complex named Canaanland, in town of Ota, near Lagos, Nigeria. 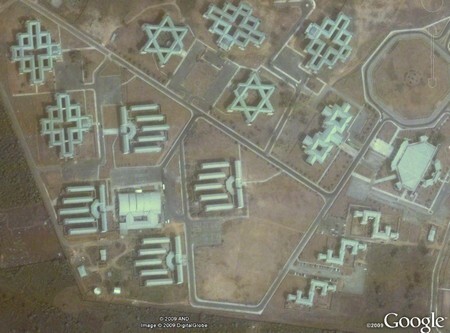 South West of the Church, and a part of this complex, is the campus of Covenant University. From the ground level the campus buildings looks like buildings in any other campus but when seen in Google Earth, (see below) the full architectural impact of designs of the university and the complex are understood.